There is no shortage of special days in life and to gift your loved ones on these special days, a bouquet of white carnations is the best gift. 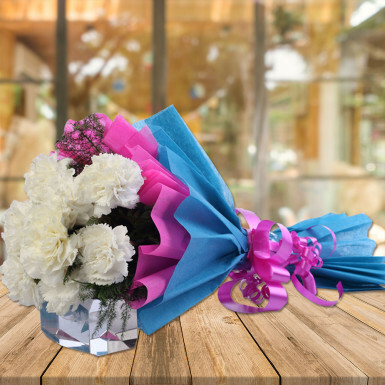 8 white carnations are wrapped in pink and blue paper packing and adorned with ribbon bow. It is an ideal gift for occasions like birthday, anniversary, mother’s day, Valentine’s Day, promise day, heart-warming and many more occasions. Carnations with white color would show your love and respect towards that special someone. So, go ahead and order now! Phenomenal Intime delivery. User benevolent application.